The following are the EMF meters that I personally use and recommend. They all serve a specific purpose in measuring the four types of EMF, are of good quality and are the best prices available. Special note: To take the mystery out of choosing which EMF meters to purchase, I recommend my favorite combinations of testing devices on my Recommended Meter Package page. They will help you accurately measure all four types of EMF pollution. 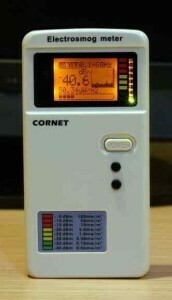 The Cornet ED88TPlus is one of the best EMF measurement devices for your money. It measures microwave radiation (RF) and low frequency magnetic and electric fields and has a sound component, which is very useful. 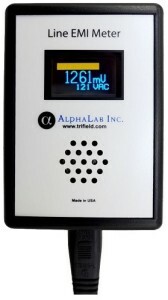 This meter is easy to travel with and allows you see if an environment has a high amount of EMF pollution. It can be found here for $179. This Gigahertz Solutions HF35C is an excellent consumer RF meter. It has a sound component for each type of microwave radiation pollution (cell towers, Wi-Fi, “smart” meters, etc.) and is sensitive to 0.1 uW/m^2. Because it has a directional antenna, it helps you easily find the contributing sources of RF exposure. A video showing how this meter operates can be seen below. This RF meter can be found here for $312, which is an excellent value. You can see how to purchase this meter here. The Acoustimeter AM-10 is another good consumer level RF meter. It covers a wide-range of RF frequencies and has a LCD / LED display, along with a sound component, which makes this an easy meter to use. However, it is not directional and not as sensitive as the HF35C seen above, so finding certain RF sources can be more difficult with this meter. The Acoustimeter AM-10 can be found here for $333. You can see how purchase the AM-10 for this price here. Here is a video that shows how this meter works. I also really like the Acousticom 2, which is smaller and less expensive, but has the same sensitive RF detection ability (through the sound function) as the Acoustimeter AM-10. You can find SLT purchase information here. This Stetzer meter measures certain frequencies of EMI / dirty electricity pollution that is on your electrical wiring. This component of EMF pollution has grown the past few years because of CFL & LED lighting, dimmer switches and solar inverters. See the video below. It can be found here for $100. Dirty electricity filters can be found here. I encourage you to also look at the Line Noise EMI meter seen below that measures a wider range of frequencies. The Body Voltage Meter is an indirect way of measuring 60 Hz electric fields by determining how they are interacting with your body. Turning off circuit breakers and using MC cable wiring will reduce these electric fields. This meter can be found here for $90. To properly ground the kit, I recommend a 50′ extension chord for $20 and a two-foot copper wire as your grounding stake that you can purchase at your local hardware store for a couple dollars. The Gigahertz Solutions ME3830B Electric / Magnetic Field Meter is an easier way to measure the AC electric fields in your home ($199). This meter measures the electric field within the surrounding environment caused by voltage in unshielded electrical wiring. EMF professionals suggest that safe readings for most people are between 0.3 and 1.5 V/m. Electro-sensitive people should try to get below 0.3 V/m in their sleeping and work environments (usually by turning off the appropriate circuit breakers). Unfortunately, the ME3830B meter is only sensitive to 1.0 V/m. You can upgrade to the Gigahertz Solutions ME3851A electric/magnetic field meter to get to the sensitivity of 0.1 V/m. 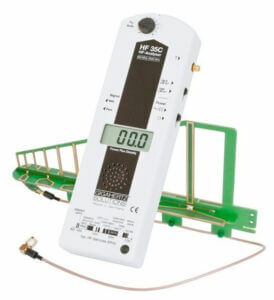 This meter can also be grounded, which adds to its accuracy. 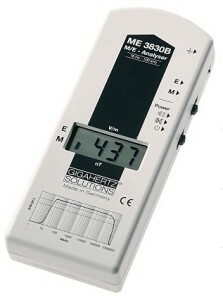 It is slightly more expensive at $360, but is a much better meter than the ME3830B. See here how to make purchases with SLT. 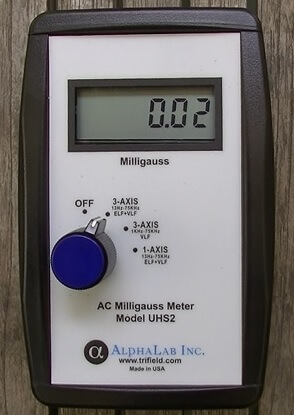 The Alpha Labs UHS2 Magnetic Field Meter is my favorite gauss meter. It is truly accurate as it measures in 3-axis and automatically calculates the readings. Most Gauss meters (including the ME 3851A directly above) only measure in one axis, so the user could be missing fields entirely. You can purchase the USH2 here for $279. Read here how to make purchases with SLT. I also recommend the Line Noise EMI Meter. This meter is also made by Alpha Labs and measures the dirty electricity on your home wiring – like the Stetzer Meter above. This meter measures a broader range of frequencies though (2 KHz to 10 MHz). This meter, along with an AM radio, is my preferred device for the measurement of dirty electricity in your home. You can purchase this meter for $117 when you read my SLT purchase information on this page.